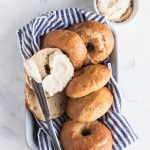 Lightly tangy with a quintessential chewy bagel crust, this Sourdough Bagel recipe is simple and delicious. Schmear on a thick layer of brown sugar cream cheese, and you have #brunchgoals! 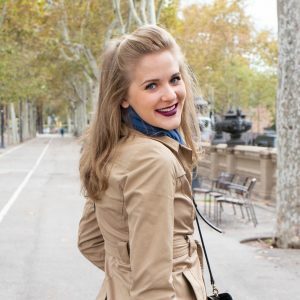 I have so many amazing memories of breakfast in New York City. That’s probably because they involve finding a bagel shop churning out freshly boiled and baked bagels, piled with so much cream cheese that it’s hard to avoid a white mustache. Of course, it’s usually followed by a day on the town, walking off all of the bagel carbs to make room for the pizza carbs. Or more realistically, the cronut carbs. Gosh I love the Big Apple. Recreating food memories at home is also a favorite of mine. Recapturing a moment through a taste–there’s no magic quite like it. And when I can do it using my sourdough starter, I’m even happier. 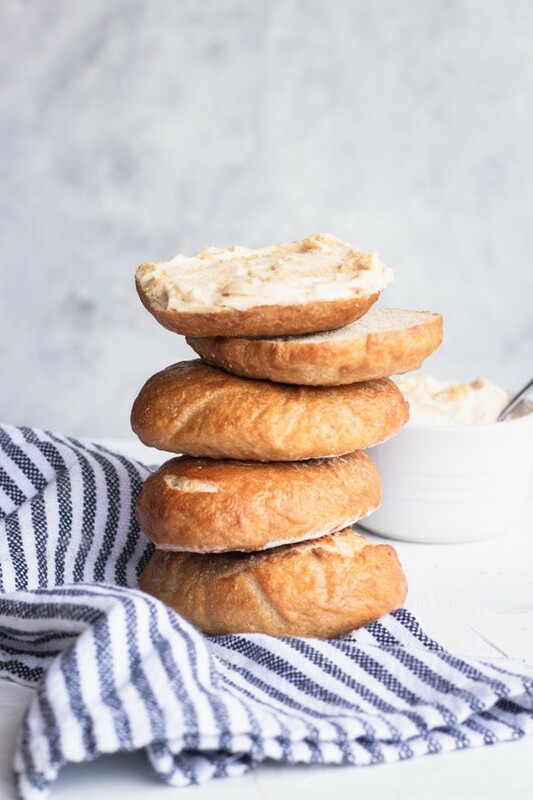 This sourdough bagel recipe is super simple. Like, you’ll not even believe how little effort goes into them. While sourdough purists may be put off by my not using a levain, I’m at a point in life where sometimes the quickest way is literally the only way something’s going to get done. I feel like I’m not the only person living that way. 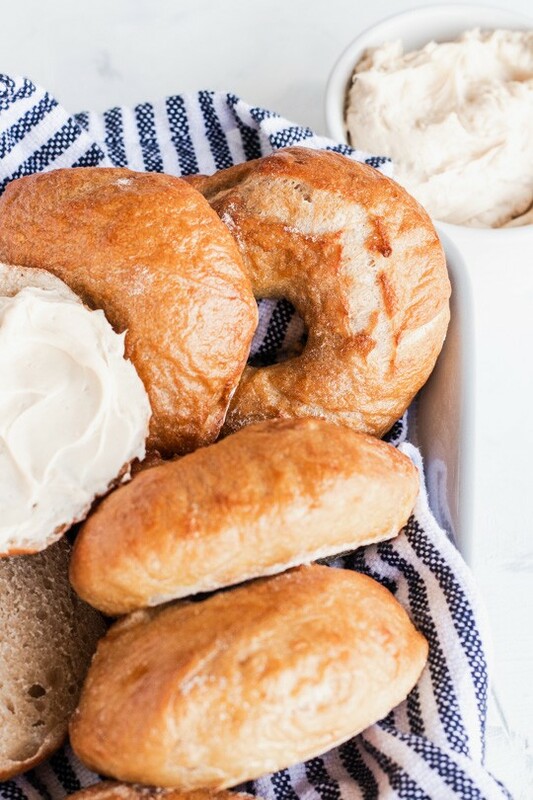 Let’s bond over these bagels and how quickly they can be made. Start the mixing/rising in the evening, then shape just before bed. Then when you wake up, all you have to do is boil and bake for a perfect bagel breakfast. It’s actually that easy. And playing with dough just before bed is scientifically proven* to help you sleep better. For real, it’s pretty therapeutic. *not actually science. But I’m pretty sure it’s true. And now let’s discuss the schmear. What bagel is complete without it? This one is lightly sweet with brown sugar for caramel-y undertones, and the addition of butter makes it extra creamy and indulgent. Basically, the higher it’s piled, the better. If schmear isn’t your style, these are the perfect way to sandwich an egg, some bacon, and melty cheese. Or! Pile on the avocado. Maybe add some lox and plain cream cheese. I’m a sucker for a fresh bagel, toasted and dripping with good butter. 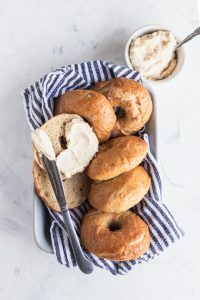 Basically, if you wanna make a bagel brunch board, these are your ticket to achieving carb perfection. Combine all of the ingredients in the bowl of a stand mixer and mix on low with a dough hook until all of the ingredients have combined. Turn the mixer up to medium and knead for 6 minutes or until the odough has come together into a firm, rubbery ball. Shape the dough into a ball and move it to a clean bowl. Cover with a clean cloth and let it sit in a warm, draft-free place for 4-6 hours. Line a large baking sheet with parchment paper, then sprinkle it generously with cornmeal. To shape the bagels, divide the dough into 6 equal pieces. Roll them into balls, the gently press them flat and pierce the center with your thumb. Gently stretch the dough out from the center, rolling it around your thumbs until the hole in the middle is about 2 inches across. Place the shaped bagels on the baking sheet, place in a plastic bag, and refrigerate overnight. 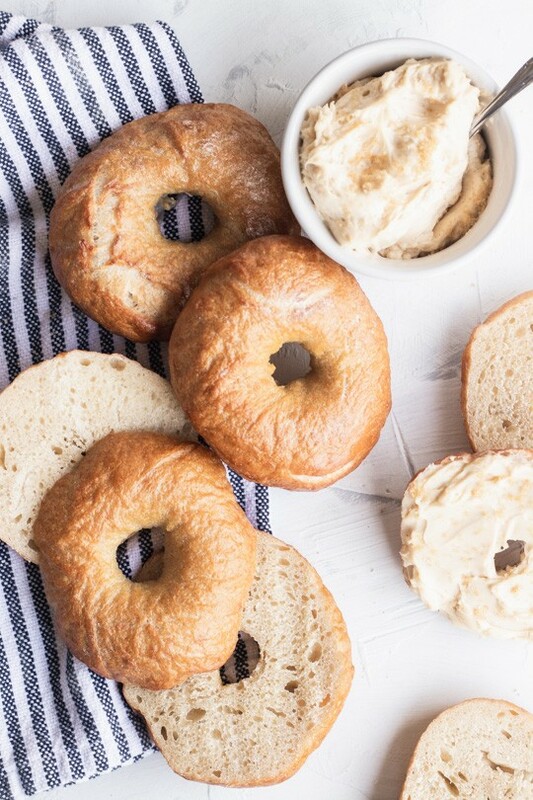 To bake, remove the bagels from the refrigerator and allow them to come to room temperature for about 2 hours. Preheat the oven to 375f, then bring about 2-3 quarts of water to a boil in a large stock pot. 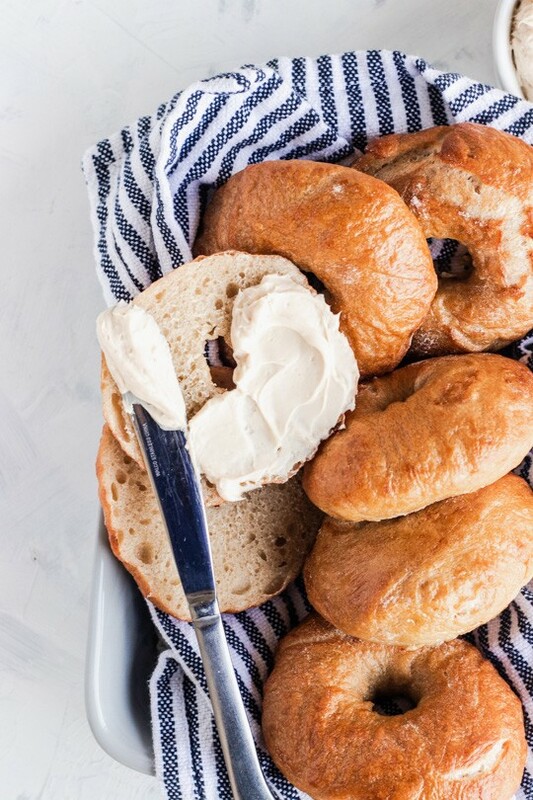 Add a tablespoon of baking soda to the water, then add the bagels two at a time and boil for 1 minute on each side. It may take them a little while to float. 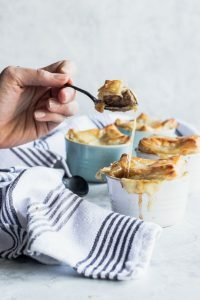 Place them back on the baking sheet, brush with the egg white, and bake for about 20 minutes or until they are golden brown on top and bottom. Best if served immediately, but they will keep in an airtight container for a couple of days. When shaping the bagels, make the hole in the center larger than your instincts tell you. 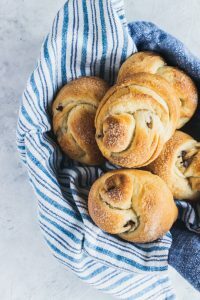 The center will fill in as they rise, leaving you with more of a roll than a bagel shape. You could add mixins (cinnamon & raisins, dried blueberries, etc.) at the beginning of the kneading, or sprinkle everything seasoning mix on the top after applying the egg wash. In a small mixing bowl, use a hand mixer to beat together all of the ingredients until smotth, about two minutes. Spread over bagels.